East Valley Life: Skinny Italian: Eat It and Enjoy It Live La Bella Vita and Look Great, Too! Skinny Italian: Eat It and Enjoy It Live La Bella Vita and Look Great, Too! Teresa Giudice (pronounced JU-dee-Chay) is the real deal. The table tossing mother of four girls (and one of Bravo’s ‘Real Housewives of New Jersey') has written a fabulous new book Skinny Italian: Eat It and Enjoy It Live La Bella Vita and Look Great, Too! The book is a 'must have' for fans of the show, or anyone who loves Italian food but is looking to eat a little healthier. I was expecting the usual celebrity fluff, a few personal stories and photos with recipes thrown in. This book is so much more. I was impressed with the attention to detail. A whole chapter is devoted to 'Blessed Virgin Olive Oil' and answers any question you could possibly have about this basic ingredient of the heart healthy Mediterranean diet. The myth busting chapter on pasta blew me away. Who knew it was so healthy? Not me! We are certainly enjoying it more at our home since we read this book. Most of her recipes are fast and easy but she also includes more complex things like directions on canning your own tomato sauce. I purchased the book because I am a big fan of the show, and I wasn't disappointed in that respect. Teresa's love for her family and friends and her wicked sense of humor comes through on every page. There are lots of family photos but not nearly enough pictures of her beautiful New Jersey home. The book has a few tidbits about the other Housewives (her take on Pasta Puttanesca had me cracking up) but it's far from being a cheesy/sleazy "tell all" book to cash in on her celebrity. 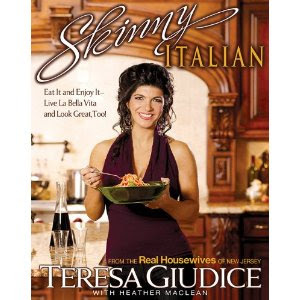 Skinny Italian is a fabulous book that would be a best seller if it were written by an unknown first time author.